Originally posted March 17. Re-posted ahead of events scheduled April 12 and 13 at the University of Illinois. We’ve written before about how the University of Illinois will have exhibits related to the 60th anniversary of the Casino Royale novel. Here’s a list of events in April that will kick off that celebration. 3 p.m. central time, April 12: Michael VanBlaricum, co-founder of the Ian Fleming Foundation, delivers a talk about items on display and how his collection of Ian Fleming novels evolved. Location: Room 66 Library, 1408 West Gregory Drive, Urbana, Illinois. 7 p.m., April 13: Concert featuring music from James Bond films by the University of Illinois concert jazz band. Location: Spurlock Museaum Knight Auditorium, 600 South Gregory, Urbana, Illinois. April 26-28: James Bond film festival. Besides movies being shown, there will be discussions about the films. Those talks will be led by John Cork, who made a series of documentaries about the making of the 007 films that are on DVDs as extras. Schedule of films and activities will be available at http://www.spurlock.illinois.edu (you can also try THIS LINK; no titles or times are listed yet). Location: 600 South Gregory, Urbana, Illinois. The university is at Urbana-Champaign, in the east-central part of Illinois near where I-57 and I-74 intersect. You can view a map of the University of Illinois campus by CLICKING HERE. If you want to go the April 12-14 weekend, expect to stay well outside the Urbana-Champaign area. There are other university events that weekend and hotels are booked. Sixty years ago, readers sampled the start of a novel by a new author. “The scent and smoke and sweat of a casino are nauseating at three in the morning,” it began. The world hasn’t been quite the same since. 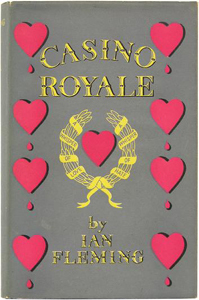 The novel, of course, was Casino Royale by Ian Fleming, published April 13, 1953. About 5,000 copies of its first edition were printed and it sold out quickly. Fleming combined the skills and experiences of two lives: his work as an intelligence officer during World War II and his experience as a journalist in spotting the right, and telling detail. Casino Royale was a short novel. But it had an impact on readers. The story’s hero, British secret agent James Bond, first loses and then wins a high-stake game of cards with Le Chiffre, the story’s villain. Later, Bond is helpless, the victim of torture by Le Chiffre. But before Le Chiffre can finish the torture, he is dispatched by an operative of Smersh for being “a fool and a thief a traitor.” The Smersh operative has no orders to kill Bond, so he doesn’t. But he carves up the back of Bond’s right hand. “It would be well that should be known as a spy,” the killer says. What seems to be novel’s climax happens less than three-quarters of the way through the story. But the new author had some other ideas to keep readers turning the pages until the real resolution. Bond is betrayed Vesper, a woman he had fallen deeply in love with. She commits suicide by taking a bottle of sleeping pills. For Fleming, Casino Royle was just the start. More novels and short stories followed. He lived to see two of his novels, Dr. No and From Russia With Love, turned into movies in 1962 and 1963 (following a CBS adaptation of Casino Royale in 1954). The author visited the set of the third film, Goldfinger, but died in August 1964, just before 007 became a phenomenon, spurring a spy craze. Six decades later, the 23 movies of the Eon Production series (plus a couple of non-Eon films) are what most people think of when the name James Bond is mentioned. 2012’s Skyfall had worldwide ticket sales of $1.1 billion. Oh, the Fleming books remain in print. Ian Fleming Publication hires a continuation novel author now and then. Periodically, there’s a new book about some aspect about the film series. Fans can fuss and debate about Bond (and do all the time). But there is one certainty: without Casino Royale’s publication six decades ago, none of that would be possible. EARLIER POST: CLICK HERE to read a March 17 post about events at the University of Illinois to celebrate the 60th anniversary of the publication of Casino Royale.